CT-N is on the air 24 hour a day, seven days a week. Click on this town-by-town listing to check the channel location and broadcast schedule for your area. 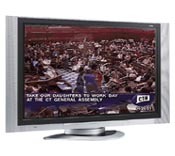 CT-N is now available on Roku®. Click here to add the CTN channel to your Roku now. At this time, CT-N is not available on satellite TV. If you’re a satellite subscriber, call your provider and let them know you want the Connecticut Network on your channel lineup. Fill out CT-N's "Satellite Subscriber Demand Survey"